Field trips throughout the area during the Verde Valley Birding & Nature Festival offer visitors a chance to spot rare and beautiful birds. Verde Valley Birding & Nature Festival celebrates nature with workshops and field trips where expert guides take visitors to the area's birding hot spots. The annual event is presented by Arizona State Parks and the Cottonwood Chamber of Commerce. Birding is the fastest growing outdoor recreational hobby in the U.S. today. 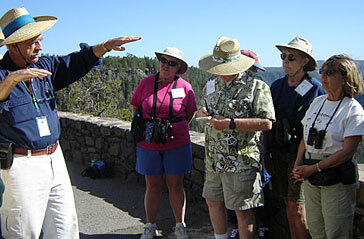 More than 70 field trips are offered throughout the 4-day event, many led by nationally recognized and local experts. From the basics to the expert, there are classes and trips that will fit anyone's skills. There are also geology trips, butterfly and plant walks, photography, an exhibit hall and an opportunity to shop at a variety of vendors during the event. Dead Horse Ranch State Park is the base camp for this event and offers camping facilities, fishing and other amenities for families and individuals. The Mission of the Verde Valley Birding & Nature Festival is to provide a unique recreational experience to anyone interested in the natural world and to foster awareness of the importance of habitat for the enrichment of all life in the Verde Valley. Registration for this event is required. Learn more at the official Verde Valley Birding & Nature Festival website.